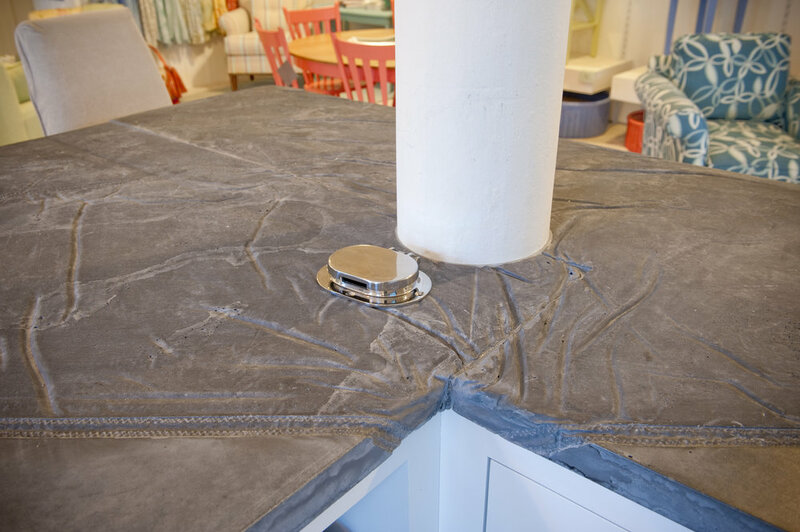 This project consisted of the concept development, design, fabrication and installation of a set of concrete countertops for a new retail furniture store in Annapolis. During our initial meeting, the owner discussed her vision of the space. 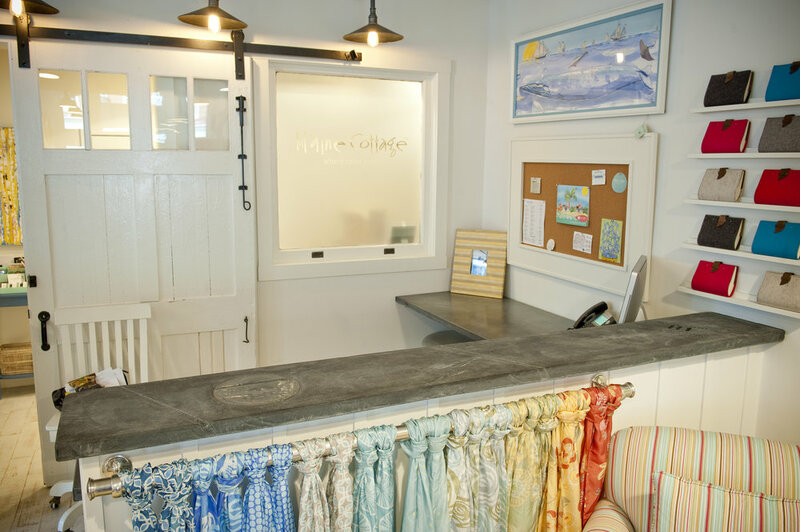 Acknowledging Annapolis’ deep sailing heritage, she wanted something nautical in the new store. The idea came forth to use an old sail as a form liner in the mould. There were two tops fabricated, the first was the cash wrap and the second was their ‘Color Bar’ – a spot where clients sit to discuss options in their new furniture. In addition to the sail liner on all the tops, the color bar countertop has the synthetic sail numbers 219 embedded for the address. A number 5 was also sewn in to some sail cloth and placed as a centerpiece. There is also a recessed ‘hatch’ for pens, markers and other sundry items for the users. The cash wrap was given a smooth circle as a space for people to sign. Their custom finish gives the natural appearance and FEEL of canvas – with stitching, creases and every other element of a weather beaten sail. Although some areas were polished for practical purposes (i.e., writing areas) the remaining pieces have the texture of old canvas. We even left some of the stitching thread to remain protruding from the concrete face! Additionally, we stained the number 5 to make it stand out more and then sprayed on some verbiage akin to what gets written on the outside of sail bags. While we have done other textured pieces before, this project is unique because unbelievably realistic feel the concrete has been able to impart!